Tweet A new version of CMON - the monitor for MySQL Cluster - has been released. Many thanks to everyone who helped me with bug fixing and beta testing! 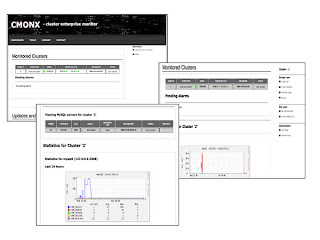 CMON monitors all events and information that you can get from MySQL Cluster. There are pre-built binaries for Linux 64-bit (I have not got around yet to do debian and rpm packages), as well as source code. It has been tested in Fedora 9 , Ubuntu 9.04, Centos 4/5, but I have not had the possibility to test on Redhat/SLES/Debian yet, so it would be interesting to know if there are any issues with it there. There are also installation instructions and a deployment guide (PDF). CMON uses the Management API to collect information from MySQL Cluster and puts this information in a MySQL database, so it can be queried using SQL. This makes it very easy to write scripts around it and there are some sample scripts on the CMON web page. # Get the list of node ids for type NDBD so that we can iterate over them easily. If you want you can also view the Cluster from a web interface (requires PHP), and you can get graphs using RRD. Installation is very simple, just run the cmon_install.sh script that is part of the package which will ask you a number of questions and write a configuration file.